It has long been believed that a short stride is superior to a long stride because the feet are moving more frequently, the skater appears to be working harder and therefore must be going faster. This, unfortunately, is a faulty logic. Let me explain…. The LENGTH of the stride is significantly more important than the frequency, for a more efficient stride and to maximize speed. The efficiency of a stride is directly correlated to the time that the blade is on the ice. The longer the blade is in contact with the ice (pushing downward through the back middle of the blade, activating edge change and more edge for the push, extending right to the toe at the end of the stride for the toe flick), the more kinetic energy that is built up, which creates a greater push forward. 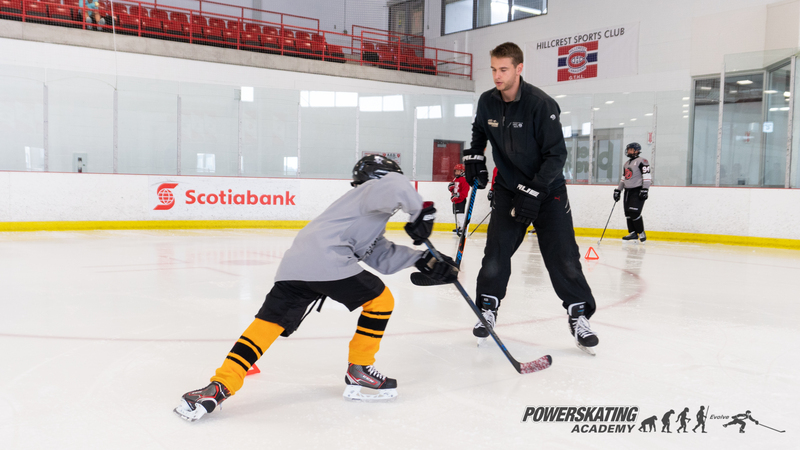 If a skater is using short strides, the blade has limited contact with the ice, there is generally less knee bend, less balance, less muscle activation and therefore less power, equating to a less efficient stride, more energy used and ultimately less speed. Long strides ensure that the essential muscles in the legs are engaging; a proper knee bend engages the hamstrings and quads, full knee extension engages the glutes and quads, and plantar flexion (pointing the toe) fires up the calf muscles, all of which lead to greater power and maximum efficiency of the stride. All that being said, while playing a hockey game you must be able to make use of a long & short stride. A great advantage of having a mindfully engrained long stride is that it can be shortened at will! Keep skating! Have fun and keep getting better. 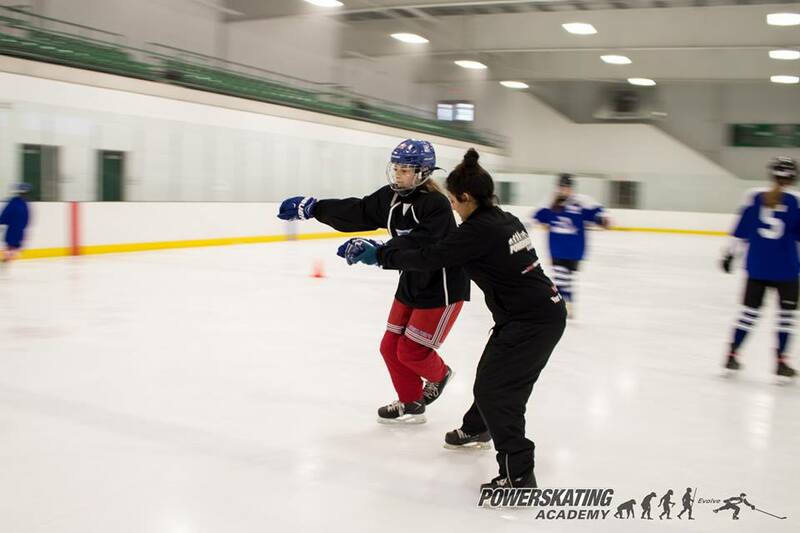 The PowerSkating Academy is a one-of-a-kind power skating school in the Toronto and Greater Toronto Area. 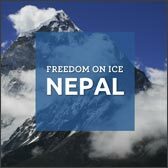 If you have any questions about this topic or any other skating-related questions, feel free to reach out to us through the website, Facebook or Instagram. I’ve been asked many times about the increasingly popular method of hockey treadmill training. Initially introduced as a rehabbing tool for pro players coming off injury, the treadmill has now evolved into a training apparatus for all ages and levels. While I believe that great coaching is more important than the medium being used, and I do believe the treadmill could be a small part of a skaters training, it certainly should not be used as a method for learning how to skate. Since the ground is moving, stopping cannot be taught or practiced on the treadmill. Enough said. Cannot be taught or practiced properly on a treadmill. A proper backwards stride starts off with an initial push off directly to the side with the heel turned out (closing the hip) and pressure on the ball of the foot. This is impossible to do properly with the treadmill moving at a set speed rather than you moving at your own controlled speed. Because the treadmill has a lot of resistance, weight gets pulled to the back of the skate instead of staying at the ball of the foot. Cross overs are taught on a treadmill as a straight line movement. The foot pushes and lifts over the opposing foot and lands on the other side. That lifting keeps your hips square to a straight line. A true cross over should be a push to an outside edge, with your foot circling around to an undercut a forward inside edge. Cross overs are an acceleration through a turn. Teaching that move properly is impossible to do when you’re forced to be in a straight line. Edges cannot be properly taught on a treadmill. In order to properly teach an edge, it must be taught on a full or half circle. Since the ground is moving in a straight line on a treadmill, it’s impossible to do a circle or half circle. If you’re looking to be a fast skater, the treadmill simply doesn’t train you to be one. When the treadmill elevates, players are forced onto the toe of their skate, which would ultimately slow them down in an on-ice situation. The more blade you have on the ice, the faster you will go. Proper stride requires that a player push their leg out outwards extending fully to the toe, however, while using the treadmill, players often have their leg pulled outward when practicing their stride. This means the treadmill ends up activating different stabilizer muscles and smaller muscles groups other than the ones used for proper on-ice strides. On the treadmill, players are in a harness. That harness often helps compensate for wrong hip positioning and doesn’t get players to understand hip-knee-toe alignment. Although the treadmill may achieve its purpose in being an effective rehabilitation tool, and be a useful tool for some players, it’s not an effective way to teach skating technique. The treadmill simply cannot make a GREAT SKATER. Why do we teach figure 8s? Simply, they are the scales to music. Math to engineering. When used properly they are one of the most effective teaching tools for all skaters, especially hockey players. The negatives: Slow and boring to watch for a parent. Very technical, so very hard for the skater to master. Too technical for the parent, it all looks the same. So why is it an integral part of our methodology? Because teaching figure 8’s is the most effective way to teach a clean and controlled strong edge. Each skate has 4 edges: forward inside, forward outside, backwards inside, and backwards outside, plus a flat or neutral. Figure 8’s teach you to master the basic pivots in hockey: the Mohawk, the bracket, and more. They teach you hip twisting for shooting in hockey. They teach you to control your upper body and hands for stick handling, passing and shooting. More hip control on the figure 8’s open hip is essential to modern day hockey skating. Figure 8’s also teach you to focus and discipline. Figure 8’s are very hard to master and there are several levels of them. They are an essential part for what we do! The most important piece of equipment a player has is his/her skates. The most important piece of equipment a player has is his/her skates. Everything you do in hockey is based on wearing skates when on the ice. For kids 12 years and under, skates should be the most important purchase you make (i.e. the most time invested in trying on different brands and sizes and possibly the most expensive purchase). Fit: Are they snug over the whole foot? They should feel like part of your foot not something on your foot. Toes should be close to the end or brushing up against the end when you stand up straight. Don’t buy skates to grow into, because skates that are too large affect a skater’s balance and can lead to potential injury. Feel: Breaking-in skates can be painful, but are a necessary part of the process. Do the skates feel solid but flexible and comfortable on your feet? Do they feel heavy or bulky? Performance: Walking around the store and on the ice, do they look tight and solid and athletic or bulky and loose? Can you stand and walk around the store with the blades and skates straight and upright? Do they make you feel confident when walking around the store and skate fast, turn sharp, etc? Great fit and feel can greatly enhance a skater’s performance. Remember new skates can have a huge effect on your skating. Ask your skating coach’s opinion on whether or not they are a good choice for you. Start off with a standard 1/2 inch sharpening without any profiling. As you get older (15/16 years old) experiment with some different sharpening and profiles. See what you like and see what your skating coach likes for you. As you get older, skates, sticks and gloves become the most important pieces of your gear. These are all very personal; take your time to think about fit and feel, then see how you perform with them. Can you make me/my child skate faster? The most common question or request I get is: Can you make me/my child skate faster? 1) Technique: This is related to kinesiology, the study of human movement and physics, in addition to the study of movement, ice and skates and skate blades, and the study of the ever evolving game of hockey and equipment. Examples of this are: maximizing the length of your stride, great posture that puts more mass on top of your skates for more power, and maximizing the amount of blade on the ice and powerful toe flick. 2) BMI (body mass index): This is the amount of muscle to fat ratio. Also, the overall muscle mass you have will have an affect. The more muscle you have, the stronger you are. The more fit you are the better your body can perform in sports activities. 3) Flexibility: The more flexible you are, the longer the stride and greater the extension on your toe flick. The more your hips open and close, the better your stride angle, also needed for more advanced skating skills and a better backwards stride. 4) Foot speed: Quick twitch muscles, i.e. sprinter muscles, relate to foot speed. 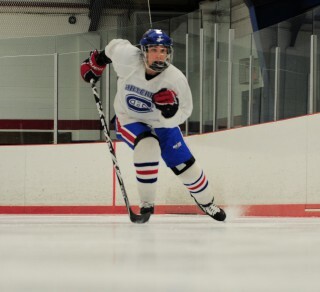 You need to work on speed-related drills on-ice and off-ice to enhance quick twitch muscle activity. 5) Mental Game: This is the most important part! If you don’t really want to go fast or think you’re fast already, or scared of the puck or corners, you won’t go faster. Wanting to go faster is the most important starting place. Training elite athletes should be done with a plan. 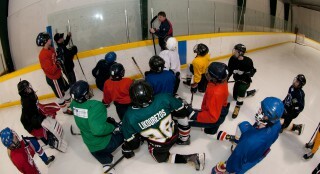 Long term development (LTD) is based on the concept of working on foundational skills first, like skating. First, you need to master some of those foundational skills, before adding to and building upon that solid foundation. 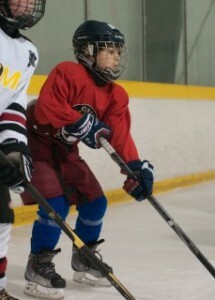 In Canadian hockey, the end for most players comes between 14-17 years old when kids can’t find or make teams anymore. This happens because players work more on playing the game or using their early size advantage and don’t spend enough time on foundation (the basics). Without that foundation, continued growth becomes impossible. If you don’t keep getting better, you will not keep achieving higher and higher levels of hockey. The LTD method involves technique first, fitness and flexibility next, increased muscle and foot speed next, and finally the mental game. People reach the highest level in any sport because of their desire, dedication, and hard work. It is essential for a player to WANT to keep improving. A by-product of constant improvement is success! LTD goal setting and time lines can be different for each player, but it is essential that a plan is in place. This can bring success beyond your wildest dreams!